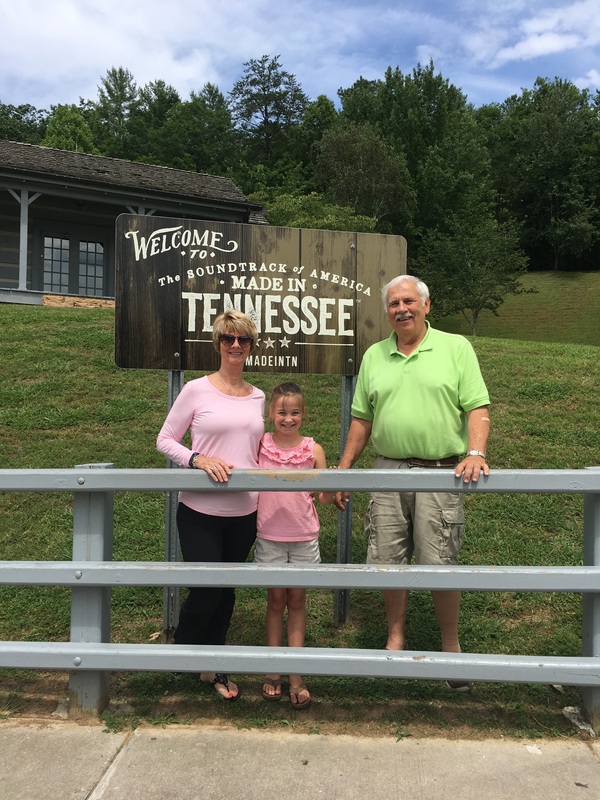 Tennessee – Let's Go RVing! Wow, what a way to start a cold day. Because of our early morning yesterday and our fatigue we crashed early last night and I slept quite well in the Hickory Walmart parking lot. We both woke up early and decided to quickly get on the road. I had planned to put stew beef in the crock pot to cook while we were traveling so Jerry was pealing the potatoes while I was getting all the ingredients together and suddenly – it appeared we had flipped a breaker. Nope, the house battery was down meaning we had no power. Because we were parked on the hill beside grass we were able to put the two passenger slides out last night but because we had no power we were unable to pull them in this morning. 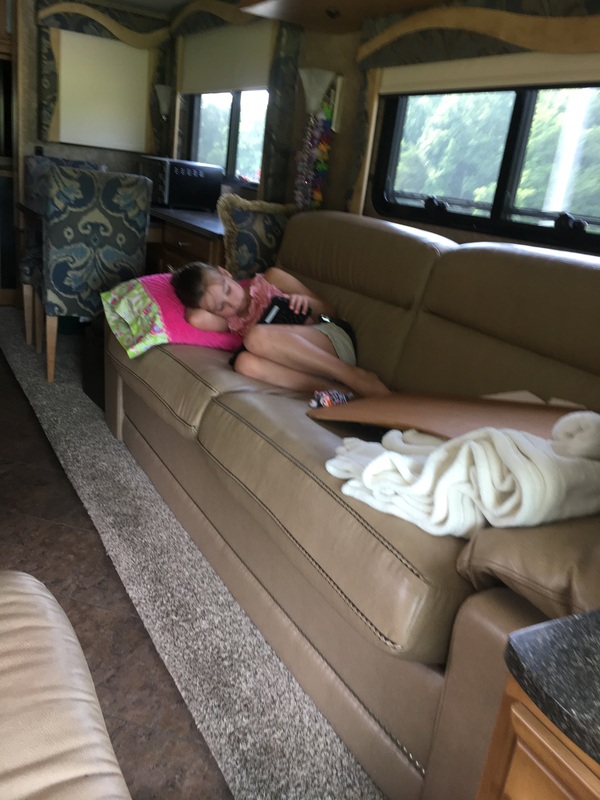 So, we started the motor home and waited while the house battery charged enough to close the slides – and waited – and waited. Knowing the heating system was drawing amps we turned that off and so there we sat in the dark, in the cold hoping that nothing underneath froze before we could get the slides in and get on the road. Wow – bad starts for two mornings. I’ve always heard that things happen in threes. Certainly hope that is not our case. Jerry finally decided that perhaps the fuses had blown although he doubted two of them would blow at the same time. He walked over to Walmart to see if they had any and of course they did not. He called to tell me and I started searching the Internet for a nearby AutoZone. As Jerry opened the door his words were “Stupid, stupid, stupid”. Because we were trying to recharge the house battery we had the motor home started and guess what? The slides will not operate when the RV is running. That was a NEWBIE mistake but in defense I can say that we were dealing with things we had never encountered before. Temperatures in the teens with winds of 18 miles an hour, a dead house battery, little water in the holding tank – the bitter temperatures and no house battery were the icing on the cake. We immediately turned off the RV, pulled in the slides, raised the jacks (yes, we had put them down lightly to stop the sway on the hill. We were still very slanted front to back) and finally pulled out a bit after 8:30. Not the start we had planned but all was finally good. Suffice it to say that RVing in the bitter cold creates problems that we don’t usually run into the warmer months. We decided to take advantage of our Harvest Hosts membership and stop in Portland, Tennessee at the local winery so off to Portland we headed. As we neared Asheville we began to see light snow flurries but I kept checking the weather and there was no indication of snow ahead plus there were blue skies and sun ahead. By the time we had passed Maggie Valley and headed into Hayward County the light snow flurries had turned into heavy snow flurries and the roads were becoming treacherous. In fact, only one lane, the right one was open and the left was covered in snow. As we crossed into Haywood County we stopped at the Rest Station. We talked to the attendant and he said that we could stay as long as we wanted so we just sat for a few minutes. When it appeared that the snow was letting up and the roads appeared clear we headed about again. We stopped around 12:45 in Farragut, Tennessee just west of Knoxville at a Flying J for gas. We like the Flying J’s because they have two dedicated RV lanes for gas coaches. Wouldn’t you know they were both out of order but it was easy to pull into a regular lane. They also had propane so Jerry wanted to fill up the tank not knowing what was ahead for the evening but we couldn’t get water to add to the fresh tank because all of theirs was frozen. While having lunch we discussed where we would spend the night. Should we try a Walmart again or Harvest Hosts? We decided to try the Harvest Hosts winery since they offered electricity. I called and unfortunately someone had called yesterday and reserved the one electric site but we were welcome to come and dry camp. We decided against going there since it was a bit out of the way plus we’d be using the generator so why not Walmart. As we rode along though we realized that we really wanted a hot shower and we wanted to extend our slides so I began looking for a campground that we could get to within a reasonable amount of time. By searching the Good Sam site and confirming with RVPark Reviews I discovered Piney River Estates in Bon Aqua not far off of our route. When I called, the gentleman said they had a site and to come on. He gave me very explicit directions insisting I not follow the GPS and also instructed me to call him when we got nearby. After we arrived I knew why! What a beautiful little campground in the middle of absolutely nowhere! We took the directed exit and drove 4 ½ miles down a two lane, curvy, hilly, sometimes narrow loopy loop road. With laughter especially after Jerry commented that we might have to drive to Florida if we needed to turn around we continued on knowing that it was not the first road we’d been on like that and most likely would not be the last. When we got to the turn off for the address I became a bit skeptical hoping that we were going the right way because the road was even more narrow and although there were scattered houses there was absolutely nowhere to turn around. I called the campground manager and he said we were about a ¼ mile away. Well, that must have been as the crow flies because trust me, it was a lot further. 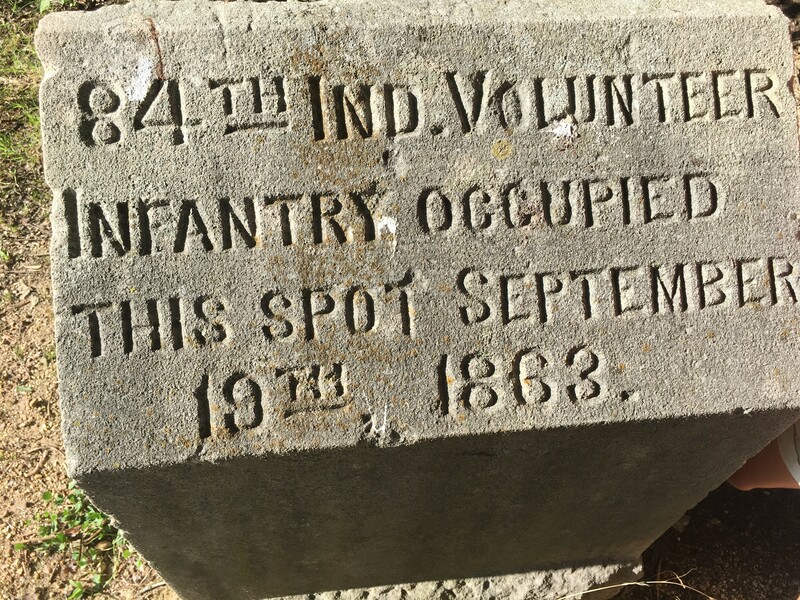 We continued down the narrow path hoping desperately that we weren’t on a wild goose chase and then voila – we saw campers and the gentleman was waiting for us. In the cold – about 21 degrees, the host and Jerry got the water hooked up and we had power and water! Yea! Before he came in Jerry put more water in the fresh water tank so I think (and hope) we are good to go now. As we were riding along the road at a little after 5:00 I commented to Jerry that it certainly was lighter here at 5 than at home. His reply was that we were further west. Well, we are further west but we realized a little later that we crossed over from EST to Central meaning it was an hour earlier. No wonder it was lighter. Then the question arose as to which time zone we wanted to keep our clocks in. Since we’ll be in central time while we are in Morrilton for the week-end I suggested we change the clocks. There’s no telling what time we’ll wake up in the morning! After we got settled I put some butter beans on to have with our deliciously smelling stew beef. It was a new recipe so I was banking on it being as good as it smelled and it was. What a treat to have dinner already prepared after a long day of travel. 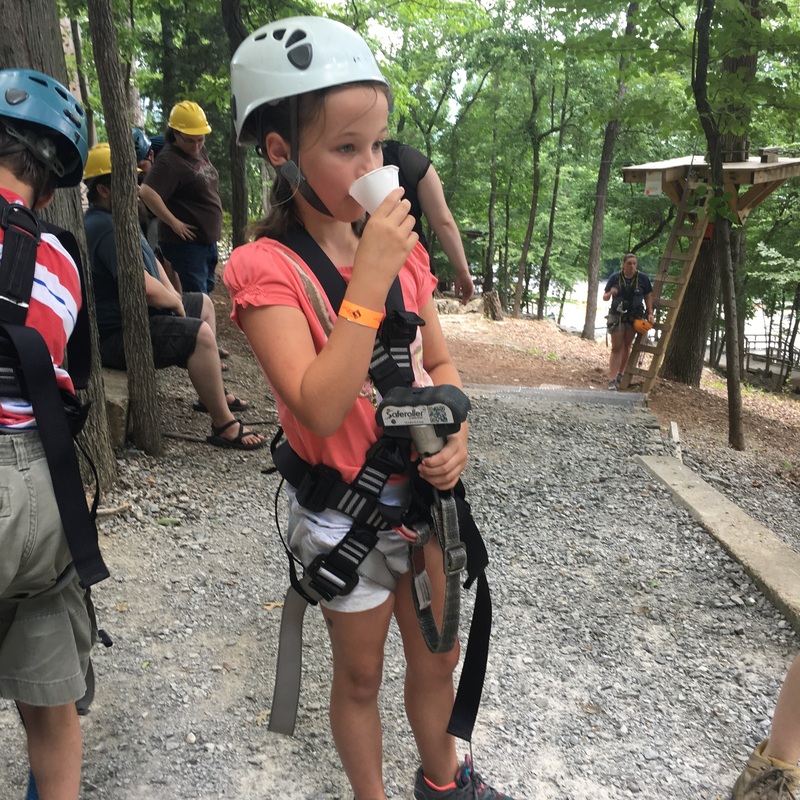 When we were at Ruby Falls on Tuesday Emma saw the sign for the Ruby Falls ZIP Stream Aerial Adventure and kept talking about it so finally on Thursday morning we headed out there. She was a little dubious of going when we first got there and I asked her if she was sure she wanted to try it. There is no refund if you change your mind so we wanted to be sure she would do it. She assured us that she would so we paid the $25 for her. We had to wait for a while and during that time a gentleman came off of the adult zip line and according to how his wife was treating him he wasn’t feeling well at all. I think that sort of frightened Emma but she was determined to do it. Her guide was Anna Rene and we couldn’t have gotten a more perfect person to do it. She was so patient and gentle with Emma encouraging her but never forcing her to do anything. Actually it is an obstacle course with a zip line in it. Emma got to go through it four times and each time chose a different obstacle. 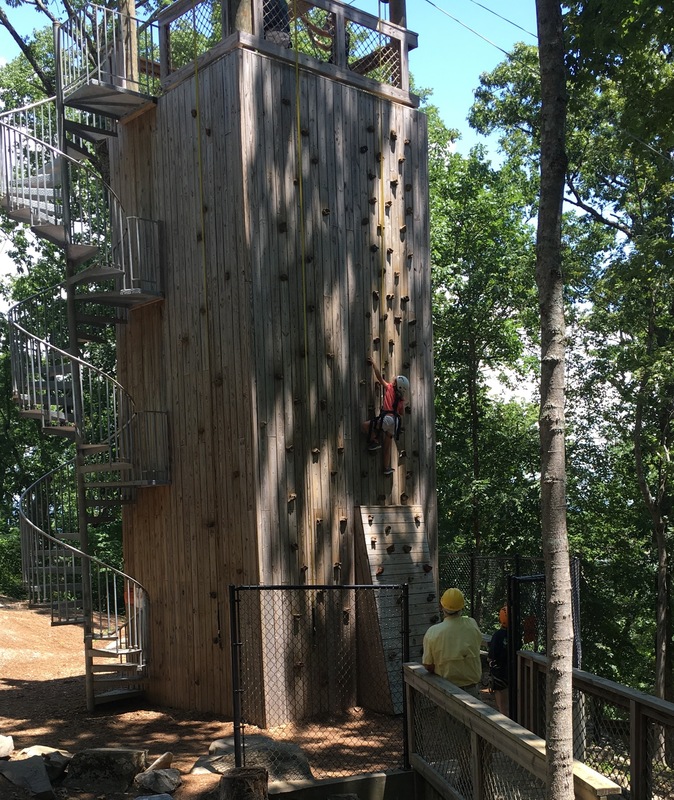 There is also a rock climbing wall and Emma climbed all the way to the top. I was amazed at her dexterity but then she is a dancer. Quite frankly, it was the best $25 we spent in Chattanooga! 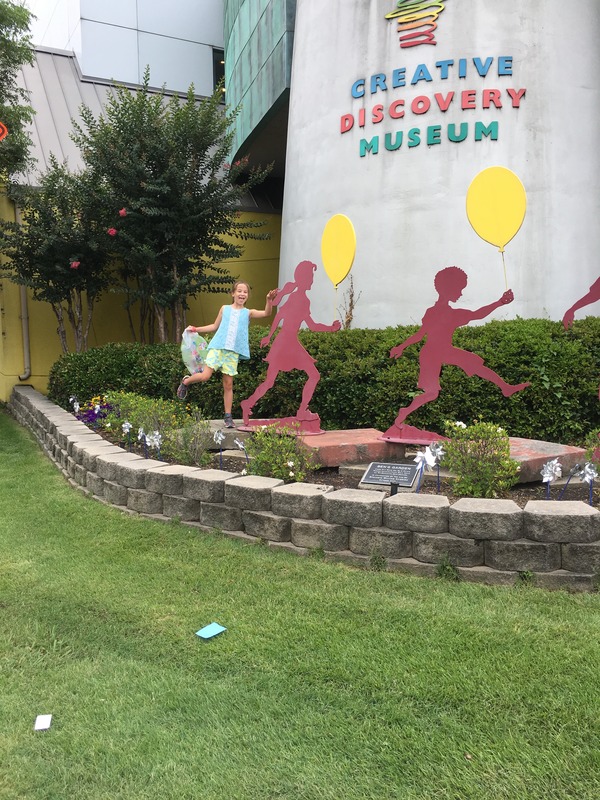 We had told Emma about the Unclaimed Baggage store in Scottsboro, Alabama and she really wanted to go there. I’m not sure if she really wanted to go to the store or if she wanted to add another visited state to her list but never the less she wanted to go. We stopped at Wendy’s for lunch and then headed to Scottsboro. It’s not too far, about an hour, from Chattanooga. The store is huge with most anything anyone would want but it seemed different this time. Their prices did not seem to be as good as when we visited a couple of years ago but Emma still found some bracelets that she wanted so another chance to spend “her” money. The ride back to the campground was long as there was pouring rain and heavy traffic but we made it. Another eventful day! Wednesday started out with a walk over the Walnut Street Walking Bridge. 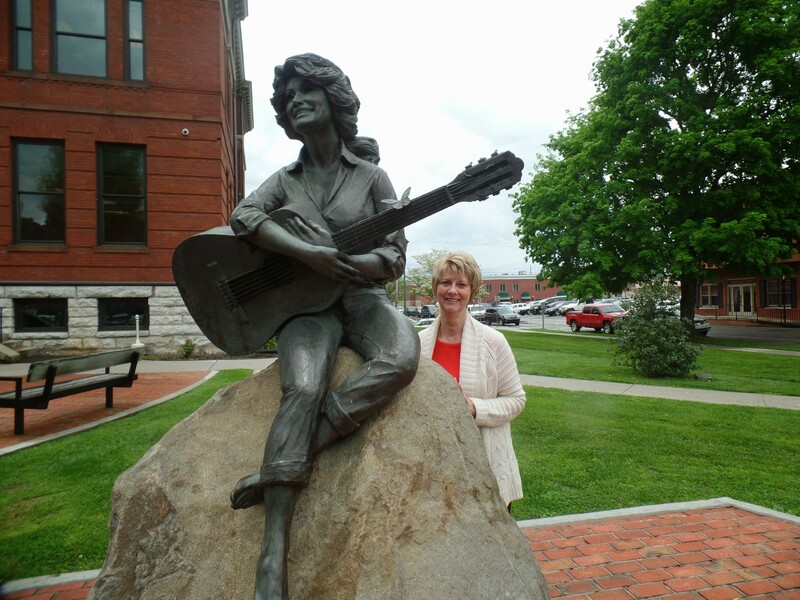 Jerry and I so enjoyed it the last time we were in Chattanooga but it was in the spring, not in hot June. It was a long walk although Emma saw a guy jogging and decided she could beat him so she took off running. She would have beat him except she had to stop at the end of the bridge and he kept running. It exhausted her though and she just plodded down the streets. We finally realized after seeing every store closed that nothing opened until 11:00 and we were too early. We walked over to Coolidge Park and there was lot of people there with children running in and out of the sprinkling water fountain. We couldn’t talk Emma into it though. Unfortunately the carousel didn’t begin operation until 11:00 either so that was a bust! We lumbered back over the bridge and saw a little ice cream shop that sold WATER! Oh, sweet relief. Our next stop was the Chattanooga Ducks, which is a tour aboard an authentic renovated WWII amphibious landing craft. We had to wait for quite a while so we went into the Cupcake Shop which I had remembered being on the corner. We walked around the street and there is was and the showcase was full of delicious looking cupcakes of all kinds. Of course each of us had to try a different one. What a way to start a day! Afterward we went back to the loading area and when we got on we were lucky enough to get the very front seat! After a very interesting tour through the city we hit the waters of the Tennessee River. It’s an amazing feeling to be riding in a vehicle on land and then suddenly be floating on the water. 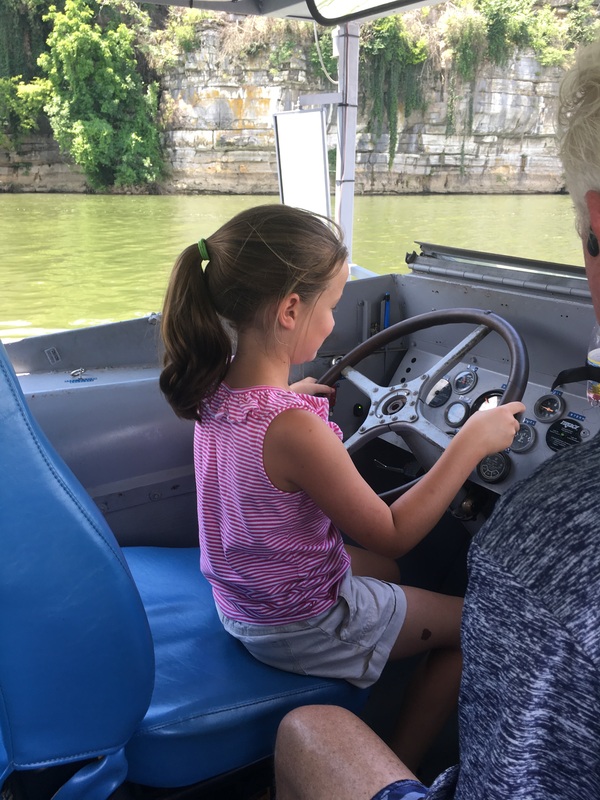 On our return trip up the river the tour guide let the children “drive” the boat and since we were at the front Emma was the first. Since she is comfortable on our jet ski she was pretty comfortable steering that large boat and did a grand job! By the time we were really hungry so we began the quest to find a good restaurant. We found a nearby restaurant that had good food and cool drinks. What more could we ask for? 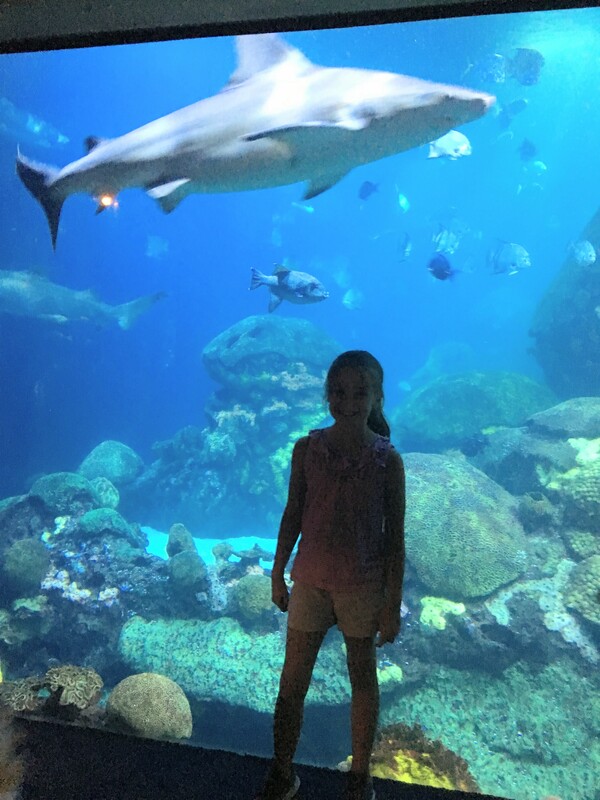 Our next stop for the day for the Tennessee Aquarium. It is a wonderful place to spend an afternoon for both adults and children. We got to put our hands in the water to fill a sturgeon and then later some stingrays. Of course we could have petted a snake too but elected not to! They have both a saltwater and a freshwater building in addition to an entire room dedicated to butterflies. Emma tried her best to get one to light on her but no such luck. We had to be checked when we exited that room to be sure that there were no butterflies on us. There were lots of interesting animals to see in addition to the many species of fish. Of course we ended up in the gift shop but Emma’s only purchase was some candy. As we headed out we had planned to stop at the Chattanooga Choo-Choo. It took us a while to find it and by that time we were all just too tired for another tour so we headed on back to the campground. 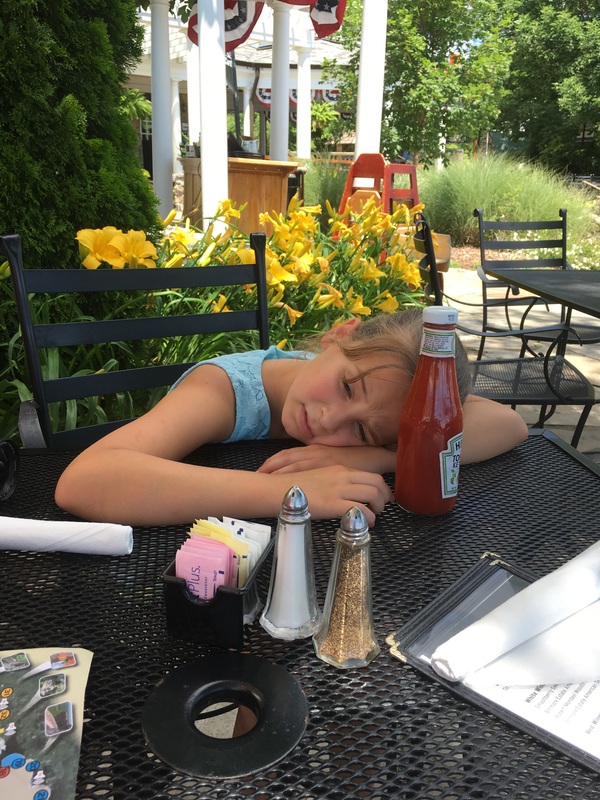 Whew – what a busy and hot day in Chattanooga. We finally got out around 10:00 (plans were 9:00). 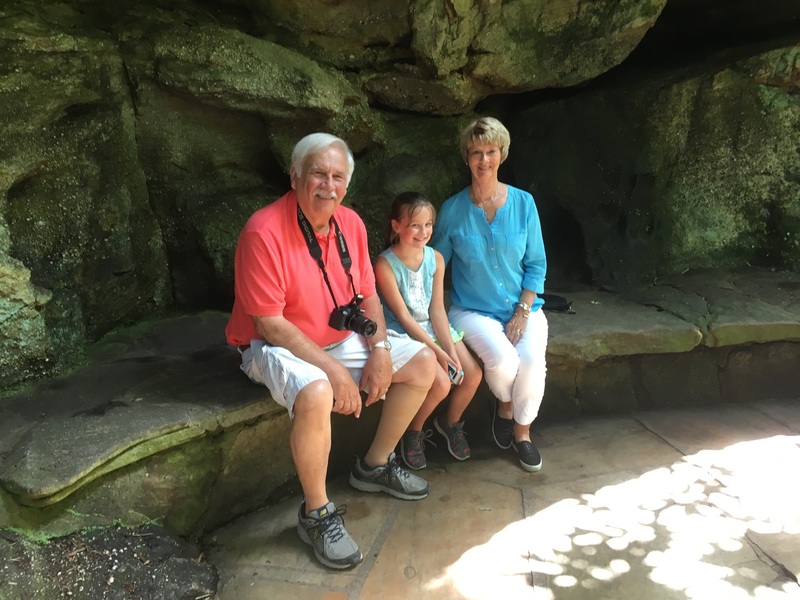 Since it was supposed to be such a hot day we decided to go to Rock City first and then enjoy the cool temperatures in Ruby Falls. That was probably one of the wisest decisions we will make on this trip! On our way to Lookout Mountain we went by Walmart to pick up a few items and thus arrived even later than anticipated. The road to Rock City is obviously a mountainous curvy road with a lot of “s” curves. As Jerry had said on the last trip,he was glad he wasn’t driving the motor home. Luckily we got a close parking place. 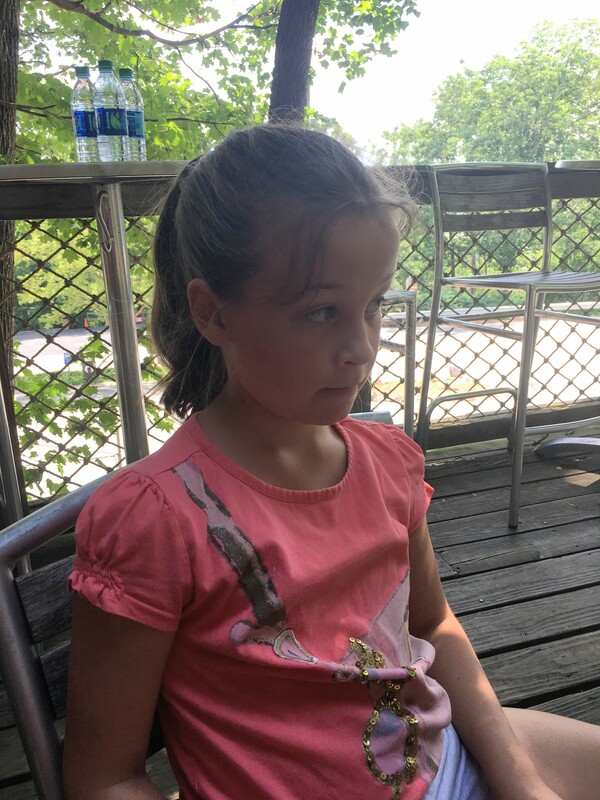 At the ticket booth we realized that we could save a little money by buying a package so we ended up buying tickets for 2 adults and one child for Rock City, Ruby Falls, Inclined Railway and the Tennessee Aquarian. How do you spell ka-ching! We headed right into Rock City and the lovely walkway. Everything is so green and lush at this time of the year although we didn’t see a lot of flowering bushes. Emma seemed to be intrigued with the many facets of the walk. Fat Man’s Squeeze was particularly interesting. We all three squeezed through! As we wandered around we realized that we somewhere took the wrong turn and had ended up at the beginning in the gift shop. Interestingly enough Emma, the one who had not been to Rock City before recognized where we were before Jerry and I did. The only way to get to the pavilion where we had planned to have lunch was to retrace our steps. Whew – we were already hot and Emma was tired too so the walk was not something we were looking forward to but we made it! We took no side trips but went directly to the pavilion, got a table and ordered lunch. I had a delightful plate of fried green tomatoes along with crudités accompanied with their homemade pimento cheese. Since it was not an entrée I ordered the chips to go along with it. Actually I ate very few of the chips as the plate was quite enough. I might add, it was delicious, almost as good as the cold glass of iced water that we got as soon as we got there! With some fuel in our bodies, a little rest in the shade and something to drink we were a little bit more energetic so Emma and I headed to the swinging bridge. We cautiously walked across it as it was bouncing because of others on it. When they got off went all the way across and then she decided she wanted to return alone so I let her go and then joined her after she reached the end. 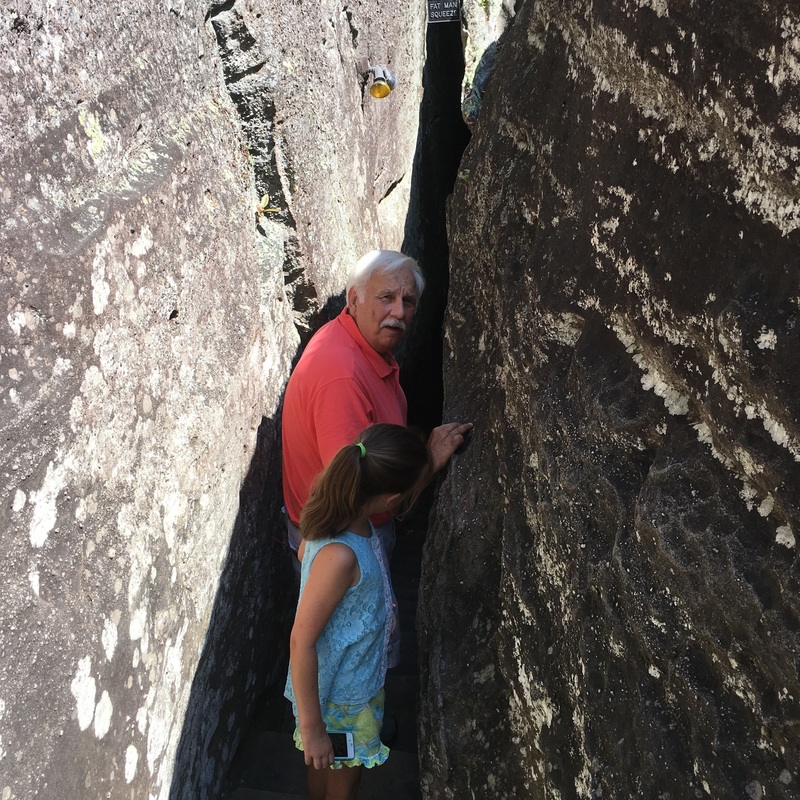 Jerry and I enjoyed Rock City this time but not nearly as much as the first time mainly due to the influx of people and the heat. When we were here in April it wasn’t so crowded and of course the weather was cooler. Our next stop was the deliciously cool Ruby Falls. Although we had a little wait time before we could go down to the falls we were at least in the air condition. Our tour guide was Austin, a college student and since Emma, Jerry and I were in the front Emma became the line leader. We were always very near to Austin so not only did we hear everything he said quite well we were able to ask questions as we walked along. The falls were very crowded today with extra buses but we still went along pretty quickly. As we walked along Austin pointed out the various interesting points and then the finale – the spectacular falls. They are natural, beautiful and the only indoor falls of that size in the country. 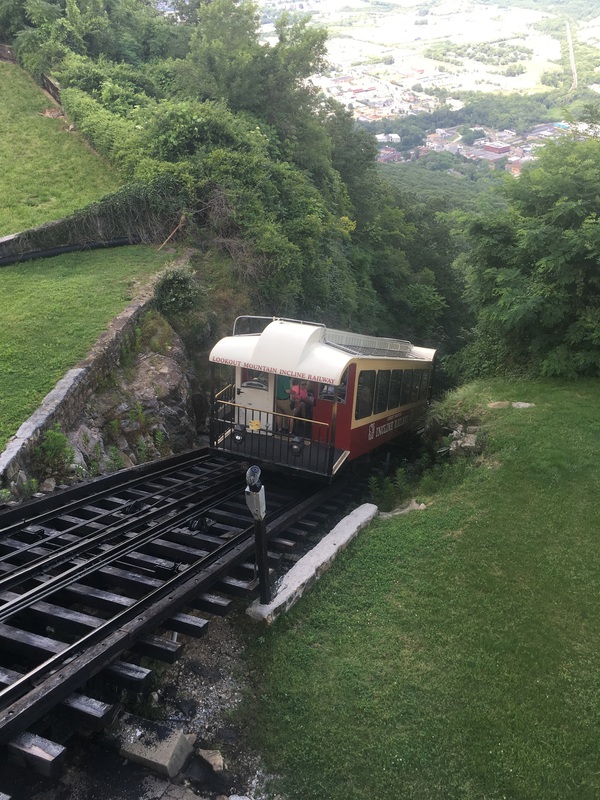 Next we headed to the Inclined Railway, rather anti-climactic really but at least we were sitting down and it was cool. We headed down the incline for the mile ride, had our ice cream cones and then rode back up. Exhausted we finally headed back to the campground. It was nearly 7:00 so a tried crew went right inside to recuperate for the next day.